A trailer for Stargate Universe will appear in theaters this weekend (August 28 to 30)! A quick update today from MGM and Syfy, who have announced that a trailer for Stargate Universe will appear in theaters this weekend (August 28 to 30)! 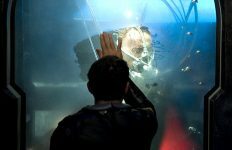 The trailer will air in select theaters before showings of Halloween II and The Final Destination 3D, which both open Friday. MGM advises us that in some locations the trailer could play as early as 9 minutes before the movie starts — so get there early. It’s not entirely clear if this is a brand new SGU trailer, or if it’s the theatrical “debut” of the pieces we’ve already seen. But either way, it will be cool to see it on the big screen! The trailer will probably run only this weekend, so don’t wait if you want to see it. 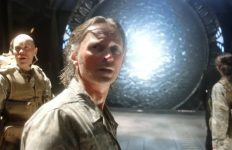 To check which theaters in your area are supposed to show the SGU trailer, visit Stargate.MGM.com or Syfy.com. 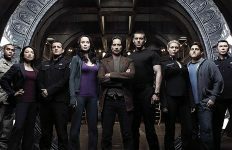 Stargate Universe premieres Friday, October 2 on Syfy. 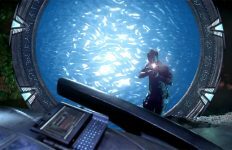 Stargate on the Big Fraking Cinema Screen would be awesome. Yeah…. So we need to go and see one of 2 crappy movies in order to see a good Show’s trailor? It scares me that they attached it to those movies… to me, it seems this would mean they’re attempting to attract a brainless crowd to the show. Typical! Only in American theatres! Hello MGM! There are stargate fans in other countries you know! Sheesh! There is a pretty awesome trailer over on a UK site, not sure if its the one for the big screen but it has me finally excited to watch the series. I literally just came out of FD3D. My mom was getting some butter on her popcorn, holding me up, and when I got to my seat my brother tells me that I MISSED THE SGU TRAILER. I was crushed. Has anyone seen it? Was it new? I’m sad, I NEED TO KNOW!